With 3 main pools plus a wading pool and hot tub, you may want to take a group vote to see where to head first. Tiki hut, at your service. Once the kids are fully into their movie, slip outside with a book or your tablet. First things first. Brew a pot of coffee, then you can start thinking about what to fix for breakfast. The resort towers over the pristine sands of the beach. Big Kahuna's water park is just across the street. 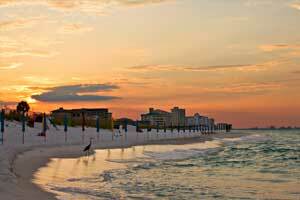 Towering over the beach on Destin’s Holiday Isle, this action-packed family resort offers tons of fun. Pelican Beach Resort by Wyndham has an indoor/outdoor pool, a wading pool for the little ones, and two other outdoor pools along with a whirlpool spa. Hit the cardio area at the fitness center, and save some energy for a few rallies on the tennis courts. In the evening, gather ‘round the BBQ grills for your own Iron Chef competition – or at the very least, award a prize for “Best Burger.” There’s also a bar onsite for cocktails and other refreshing drinks. Condo rentals feature full kitchens, living and dining rooms, and private balconies. You’re right across the street from Big Kahuna’s water park, filled with twisting slides, a lazy river, and 40 other must-brave rides and attractions. - Front desk is open 9:00 AM-5:00 PM daily. The check-in location differs from the property location. To check in, go to 35000 Emerald Coast, Destin, FL 32541. Check-in must be completed prior to going to the rental property. Guests who plan to arrive outside of front desk hours must return to the office the next day by noon to complete check-in. For more details, please contact the office using the information on the reservation confirmation received after booking.